Decorate your life and garden with the LiyanQ Fairy String Lights. It is really long, 33ft 100 Leds can give you many choice to decor your gardens, patio, gate, yard, wedding, party etc. It is really Wonderful. Outdoor decor is brilliant, it is waterproof, so no worry to use them in the rain. 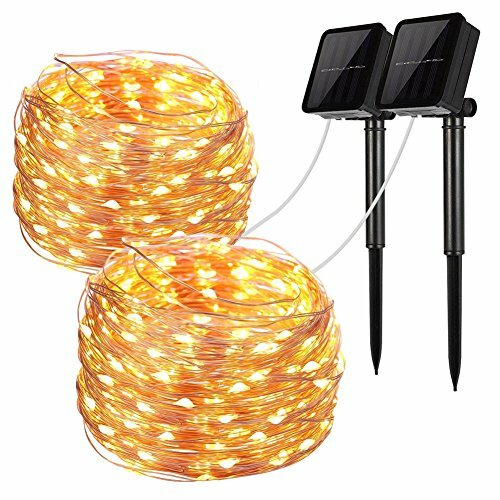 Solar Powered Fairy String Lights - Get 2 in 1 package! Each string light is with 33 feet moldable copper wire and 100 glowing micro Leds, with steady 360 degree viewing angle they illuminate in every direction. Ideal for decorating your gardens, patio, gate, yard, wedding, party etc. High Quality Copper Wire Lights - LiyanQ copper wire is super thin and flexible and the Solar Copper Wire Lights can be easily bended, and shaped around plants, signs, furniture and almost everything else. Meanwhile with low-heat-emission LED bulbs, the LED string lights will not overheat after using it many hours; Easy to storage and ready for the next use. Also, it is environmental- friendly, high energy conversion rate, durable and safe to use. If you have any questions about this product by LiyanQ, contact us by completing and submitting the form below. If you are looking for a specif part number, please include it with your message.